This "Historically Speaking" column appeared in the Exeter News-Letter on Friday, January 3, 2014. What can we expect for the year 2014? Chances are whatever predictions we make have a slight statistical chance of proving correct, so let’s go with the obvious: this winter will be cold and snowy and the summer will be hot and steamy. 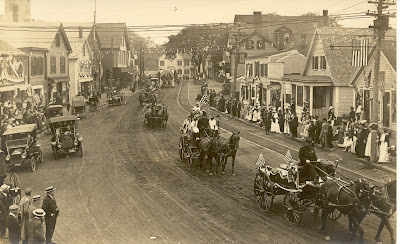 But the historian’s job is not that of prediction, it is that of reflection, so let’s take a look at Exeter, New Hampshire, in 1914,one hundred years ago. The basic layout of the town was the same as it is today, but some landmarks that we’re used to seeing weren’t built yet. The Ioka Theater didn’t exist in 1914. Movies and live shows were performed at the Exeter Opera House on lower Water Street where the Folsom Tavern sits today. The Swasey Pavillion, which most of us know as the bandstand, also wasn’t built yet. Each summer a rickety wooden bandstand was dusted off and hauled from storage into the center of town for evening band concerts. By 1914, it was so structurally unsound that band members feared for their safety while performing. Portsmouth Avenue was sprinkled with homes and farms and not businesses. Phillips Exeter Academy was a cluster of buildings on Front Street. Exeter Hospital had moved from its original location on Pine Street to its current location on Buzzell Avenue back in 1906. Technologically, we were more mechanized than in previous generations – cars were becoming common, electricity was buzzing through many homes, central heating and plumbing were viewed as necessities. Woodrow Wilson, a Democrat, was president in 1914. The political climate in the nation was still firmly planted in the Progressive Era, which was characterized by political and social reform. This may have been the reason the January 2nd edition of the Exeter News-Letter announced that, “the morning bell of the Exeter Manufacturing Company for commencing work will ring at 10 minutes before seven instead of 6:20 as has been the custom for upwards of one half a century. The change is occasioned by the new labor law of 55 hours a week, which now goes into effect. There will be no reduction of wages for the shorter working hours, the new law in this respect giving a net gain of time to employees.” That breaks down to a ten-hour workday with a half day on Saturday. With a work certificate, one could start working in the mill at the age of 14. So, for labor at least, conditions were improving. In August, the Exeter Manufacturing Company stopped production for three weeks for renovations. Luckily, the furloughed employees were paid a generous 5% of their usual wages while waiting for the mill to reopen. 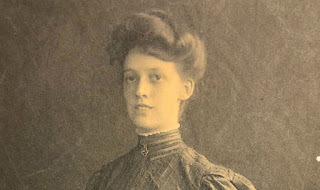 “The Main Academy has burned!” detailed a young Betty Tufts in her diary on July 3rd, 1914. Phillips Exeter Academy had just announced the hiring of their new principal, Lewis Perry, when the fire struck mysteriously in the middle of the night. Tufts, like many Exeter residents, spent a good part of the night on Front Street watching fire fighters extinguish the blaze. The building was a total loss, but there were no injuries. A fire in Salem, Massachusetts, in June was far more devastating, burning an estimated 253 acres of the downtown and leaving 20,000 people without homes. The Salem fire could be seen from Hampton Beach. 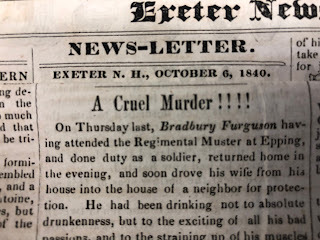 The same edition of the Exeter News-Letter that described the Academy fire also reported that a fundraiser at the Exeter Opera House, held just two days after the Exeter fire, had raised $40.25 for the suffering families in Salem. Phillips Exeter Academy was quickly able to raise funds for a new building. The summer brought news from Europe that Archduke Franz Ferdinand of Austria was assassinated, leading to escalating tensions. On August 2nd , Germany invaded Belgium launching the hostilities that would begin World War I. If there was any concern in Exeter, it was lost among a week-long celebration of Trade and Carnival Week. There were events held all week including two separate parades. The Trade and Mercantile parade on August 4th was enormous and featured nearly every business and civic organization in town. A motorists’ parade was held several days later allowing residents to show off their new cars. This event was followed by a ‘slow’ race through town, which would disqualify any speeders or drivers who changed gears too quickly. As the war in Europe heated up, concern for local people traveling was expressed frequently, but the idea that the United States would be directly involved was discounted. The election in November brought the Republican Party back to the Governor’s office with the election of Rolland Spaulding. His campaign material boasted, “He is a young man, progressive, aggressive, thoroughly representative of modern political ideas and ideals!” The town also voted to stay dry, opposing the chance to license saloons in town. 1914 ended with the usual crush of Christmas events and preparations. Most likely people in Exeter would later look back on the year and remember it for its local events – the fire at Phillips Exeter Academy and the Trade and Carnival Week – as well as the world events that would later overtake the news. But at the beginning of the year it was nearly impossible to predict the events that took place, except that the winter did prove to be cold and snowy and the summer was indeed hot and steamy. Photo Caption: In 1914 Exeter held Trade and Carnival Week during the first week of August. The parade was held on Tuesday, August 4th. At the same time in Europe, World War I began when Germany invaded Belgium.